I don’t understand how people didn’t like this book. After I write this review I’m going to watch some book review videos on YouTube, because I loved this book! This was a great continuation of the Court of Thorns and Roses series, and I honestly do not understand why people hated this book so much! Everything wrapped up perfectly and all the characters grew so much. But this was so good. I do admit, it was VERY slow in the middle. Part two was so slow, but it’s just one of those books you have to get into the groove of reading larger sections at one time and you’re A OK. That being said, I’m all here for the slow burn books. I love when you have to wait to figure everything out. It builds suspense and makes you want to finish it even more. This book did take me quite awhile to read, but I think it’s because I started it and then got distracted because I was home for winter break still and then I took a trip to visit my aunt, uncle, five-year-old cousin, and two newborn twin girls, but I thoroughly enjoyed this nonetheless. I cannot wait to see what happens in the next book because this was originally supposed to be a trilogy, I think. I need to know what happens with Nesta and Cassian, because their mating bond is going to snap into place any time and everyone knows it. Elain and Lucien are going to have their mating bond situation all figured out and they’re going to be helplessly in love cause AWW. Also, Amren. I was pissed off when I found out that she was lying to Feyre, but then it all worked out so I’m cool with that. Rhys though. Oh. My. Gosh. I thought he was actually going to stay dead forever and when Feyre found out that he also made a bargain with a monster I was so shooketh. Because she did the same thing and didn’t tell him and he did the same thing to her because they loved each other so much that they just didn’t want one another to be mad or sad or worried. And Feyre went and found the mirror for the Bone Carver. Excuse me. Cool and so badass. 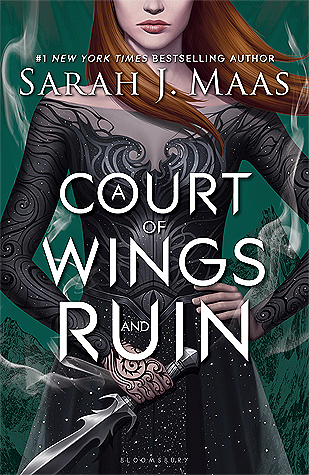 One of my favorite parts from this book was the whole scene where Feyre goes and summons the Suriel and then it also brings Ianthe and her cronies. SHOOK. I was shook. I loved that Feyre stayed with the Suriel and also led Ianthe and those people to their death, but not before Rhys figured out how to get the Weaver. Man oh man.